A house divided against itself takes its football very seriously. 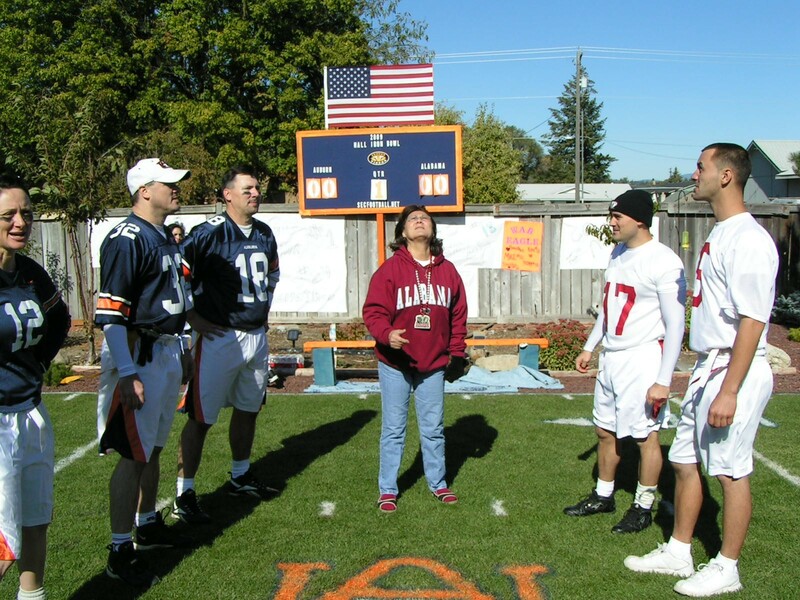 The first official Iron Bowl was played in Spokane, Washington, behind the house of a real estate broker named Teddy Hall. That first stadium, Jordan-Hall, when lined and converted from serene suburban dog shelter to Auburn vs. Alabama clan clash arena, was 20 yards long and 10 yards wide and lined with interlocking AU flags and homemade War Eagle banners. Confused? OK, step back with me three steps. 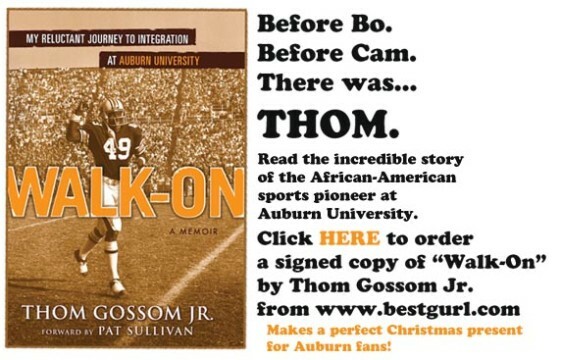 When I said the Iron Bowl, I really meant the Hall Family Iron Bowl. It’s not The Iron Bowl. But it’s not far off, in spirit at least. One is an eternal struggle between two teams of differing locations and color schemes and – sure, why not – ideologies for the admiration and bragging rights of an entire state and the other. . . well, the other is certainly a struggle, an eternal struggle even, between two teams of differing locations and color schemes, and it’s no doubt for bragging rights, but not for an entire state. No, the scale is smaller, but the passion is similar. Do you really think any other rivalry could spawn such an event? The game serves as a type of family reunion. The site of the Iron Bowl determines the location. 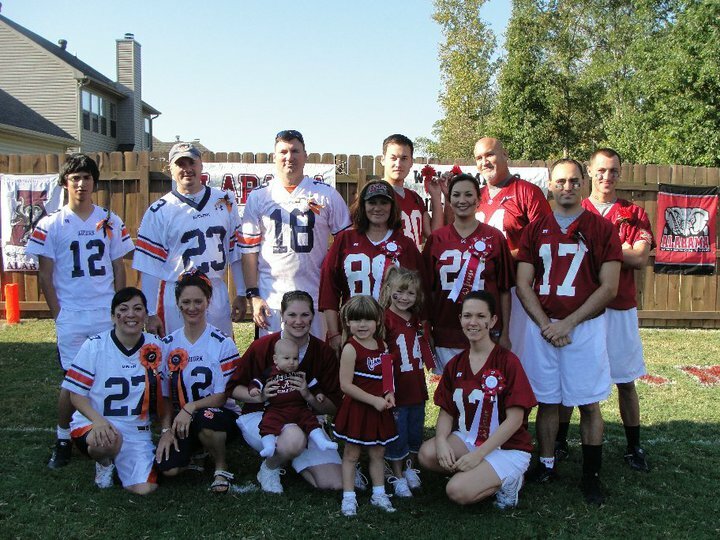 If the game is in Auburn, one of the Auburn family members hosts and Auburn gets to wear the home jerseys. And vice versa. 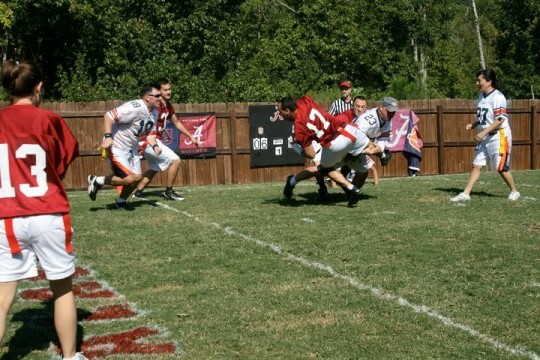 This year’s game was in Birmingham at David’s house because the actual game is in Tuscaloosa. Bad news Auburn faithful: Alabama won this year’s contest. And the year before and the year before and the year before. The Auburn Halls have never won actually. They did tie once in 2004, but that was because two games were played and each side won one. The site lists Auburn’s record as 0-5-1. “We’re so much more talented, and they make more mistakes in the fourth quarter,” David says. The problem, as the brothers said, is the age difference—Mike is 41 and Teddy is “pushing 50” (crack TWER reporting puts him at 47) while the Alabama brothers are in their 30s—and Auburn’s lack of depth. This year, Alabama had eight players and Auburn only four. Almost metaphoric or something . . . The family members wake early and eat breakfast together on gameday. They put on their jerseys and the team captains meet to discuss rules. The rules are there are no rules, not really. There is a referee, but his sole job is to spot the ball. There is no pass interference. The men tackle the men and pull flags for the women. They play four quarters with each side getting three possessions per quarter. There is no clock. Sometimes the game can last three hours, maybe more. These two teams know each other. In part because they’re family, but also because the two sides actually watch film of previous games and discuss their gameplan. I told you, they’re serious. The brothers aren’t sure how long they’ll keep playing, but Mike at least would like to keep keeping on as long as his body will let him. As he and Teddy age, they realize the key to every healthy and competitive college program—recruiting. Next year’s game will be in San Marcos at Mike’s house. He’ll be lining a paintball course he owns and there will be plenty of room for spectators. In years past, might’ve been this year actually, they’ve had 25 or 30 people present to cheer. So if you’re near the Hall Iron Bowl this year or in future years, stop by and watch a game purer than any you’re likely to see on television. Wear orange and navy to let them know you’re family. 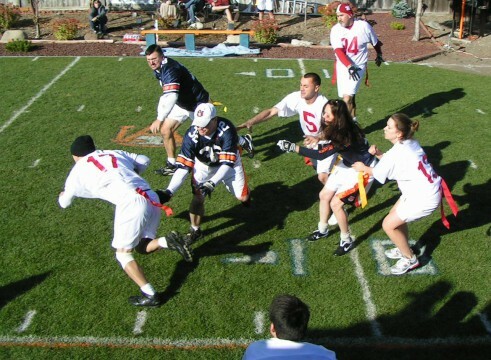 I attended one of the famous Hall Iron Bowls (the year Cindie broke her finger) the game is incredibly intense while they are playing. When teams make a touch down the fight song is played. The love and spirit of their competition is amazing. Anyone in or around the area that the game is being played should attend – the Hall family is keeping alive a tradition that many have lost years ago – no need for Wii or other games, they have an in your face game once a year! the lack of humidity has caused brain damage in you southern Land Fish! If I get a divorce I’m going to marry one of those girls.